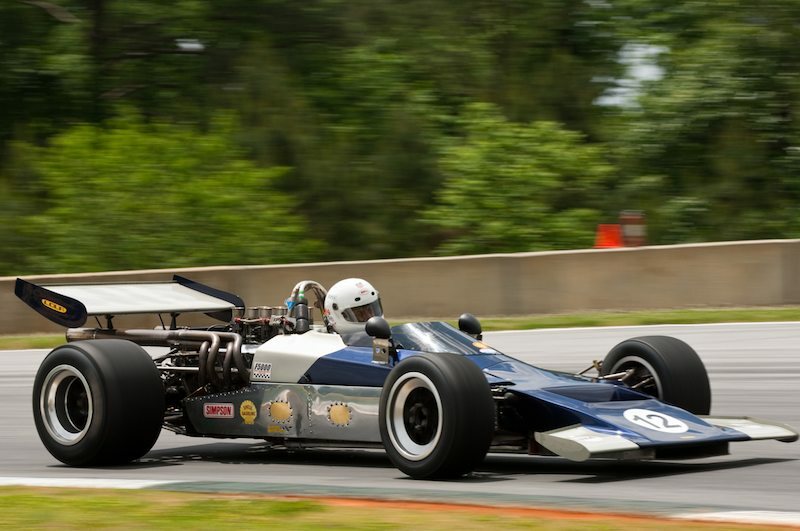 Once again this year, the great vintage event that is “The Mitty” took place at Road Atlanta in Georgia from April 30 to May 2, and, as usual, there were great old cars, great old drivers, lots of stories swapped, and a full weekend of great vintage racing. 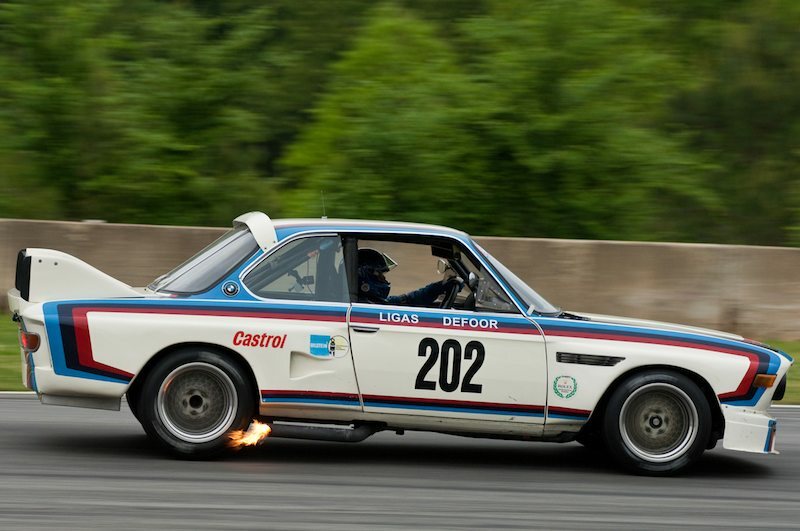 The oldest historic car race on the East Coast celebrated its 34th anniversary in 2010, featuring 28 races over three days and a lineup of more than 250 historic race cars. Peter Brock was Grand Marshall of the festivities and was honored at a special dinner Thursday night at the track. The first feature race of the weekend was the Small Bore Enduro, which took the green flag a little after 6pm on Friday, April 30. It was bright and sunny, with a light breeze and temps in the high 70s. Sadly, it would be the best weather of the weekend. The race was dominated by John Harrold in his 1968 Chevron B8, but, due to a special handicapping system for this race, his terrific pace led to a 16-minute pit stop, designed to even out the competition among the wide variety of cars in the field. 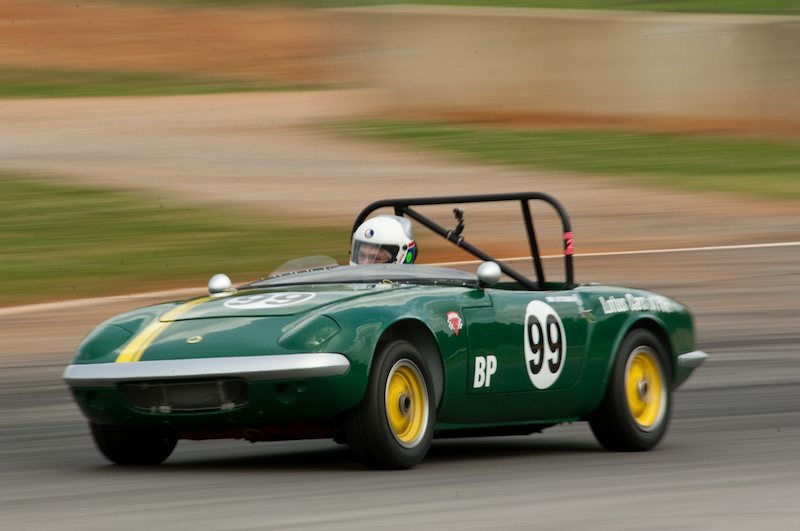 This brought Charles Guest’s 1967 MG Midget to the front, with second place going to Dennis Gonzalez in his 1966 Sprite, and third to Warren Aplin in a Triumph TR-4, with the entire podium in doubt until the checkered flag fell. Saturday was cooler and overcast, and there were a few sprinkles of rain in the late morning. The first major race of the day was the Vintage Enduro, featuring most of the same cars from the Small Bore Enduro, and, fortunately for John Harrold and his Chevron, a different set of pit rules. 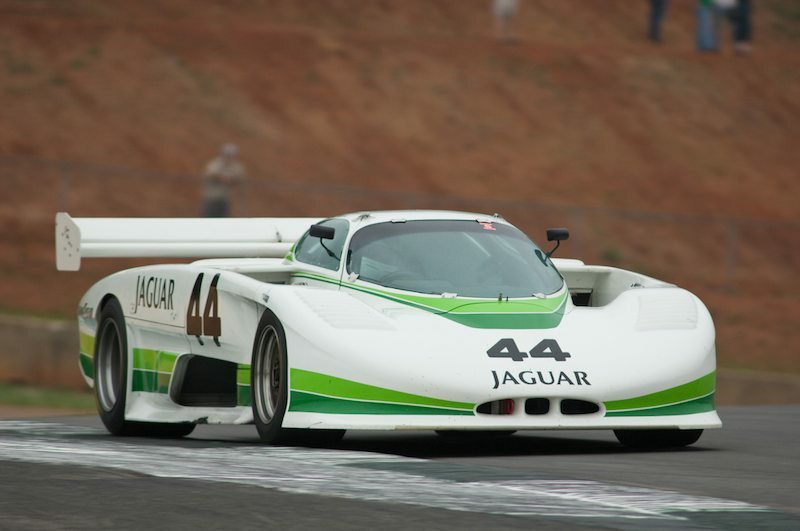 For the first half of the race he chased AC/DC lead singer Brian Johnson’s Royale RP4 around, trying to catch his tail. 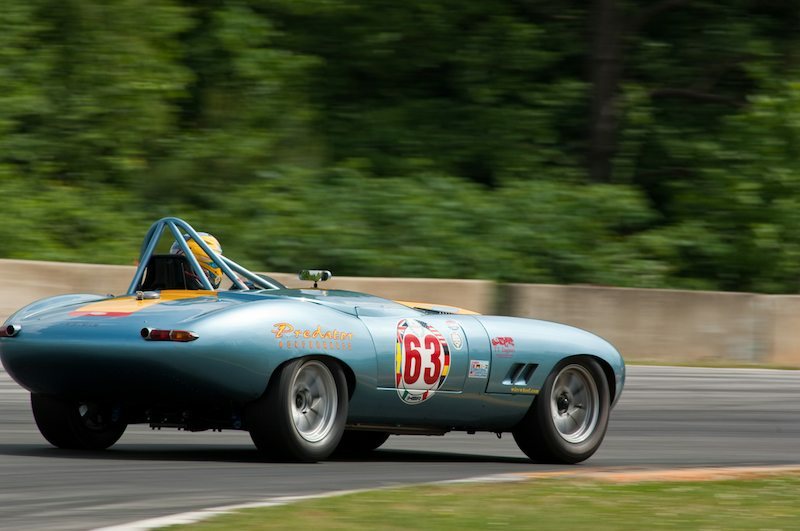 It was great racing, and following just a few seconds behind for the first half of the race was Farrell Preston in his beautiful 1963 Jaguar XKE Roadster. 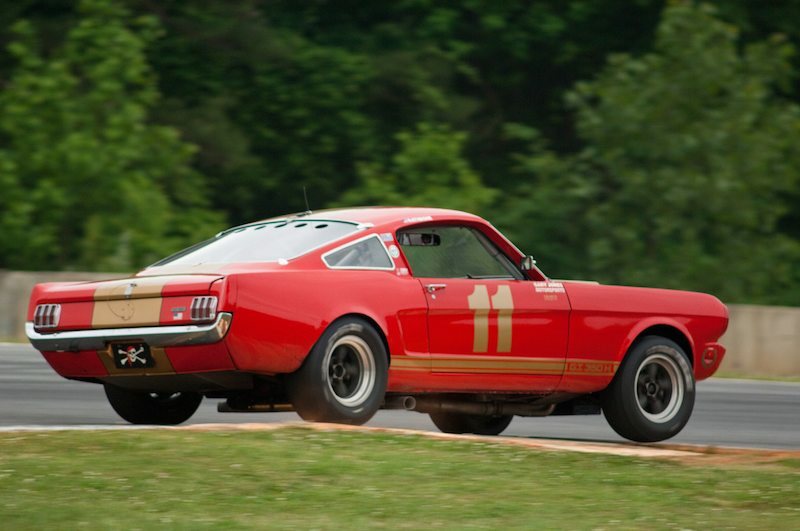 Harrold and Johnson pitted together, but Harrold was quicker in the second half of the race, and won by a comfortable margin, with Johnson second in his Royale, and the last spot on the podium went to Jerry Loftin in his 1965 Shelby GT350. There was a bit of rain the first 20 minutes of the race, but not enough to force the teams to change to rain tires, and the track was dry the last half of the hour-long event. Sunday morning’s first race started at 8:15am, and was the “Classic GT Enduro.” The sky remained overcast and threatening, and there was enough rain to cancel the vintage motorcycle practice. Again, not quite enough rain to have the teams change to wet tires, but enough to make it nice and scary, especially the entrance to turn one, the bottom of the hill going up to turn 5, and the entrance to 10a, where water collects at Road Atlanta. 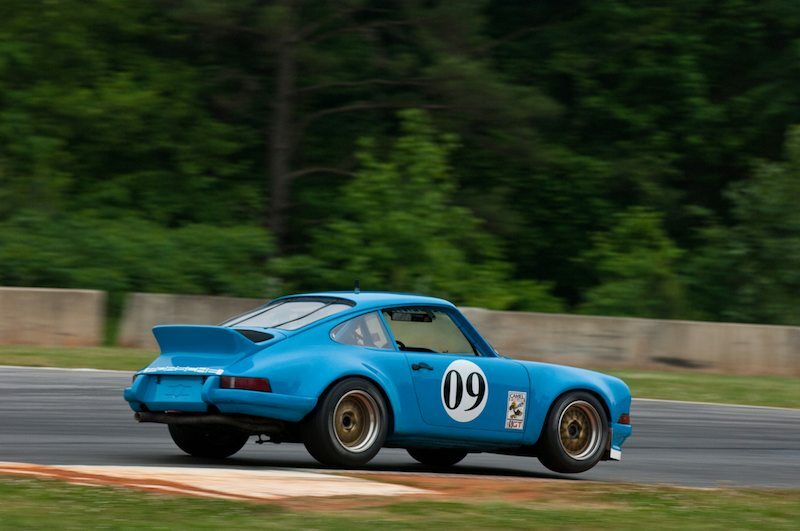 This enduro featured a great battle for the lead throughout between Richard Duffey and his 1985 Swift DB-2, and Eric Bretzel in his 1972 Porsche 911 RSR. Two cars which would not ordinarily be seen together on the same track at the same time, but HSR’s performance formula worked very well in this case. Asa Chandler’s 1987 Swift S2 took third. 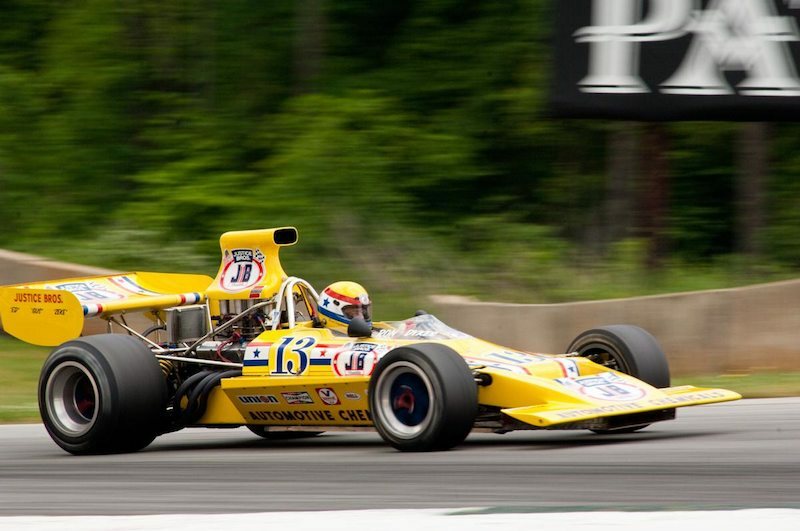 Fortunately, there was two hours of quiet time following this race, and the rain stopped, and the track had time to dry out before perhaps the most anticipated race of the weekend, the Formula 5000 feature, including cars covering the entire F5000 era, from two 1969 Gurney Eagles to a 1976 Lola. Pre-race pageantry included grid girls with signs for all of the drivers and cars. The race was green-flagged at 12:30pm, and the roar of those American V8s was glorious. 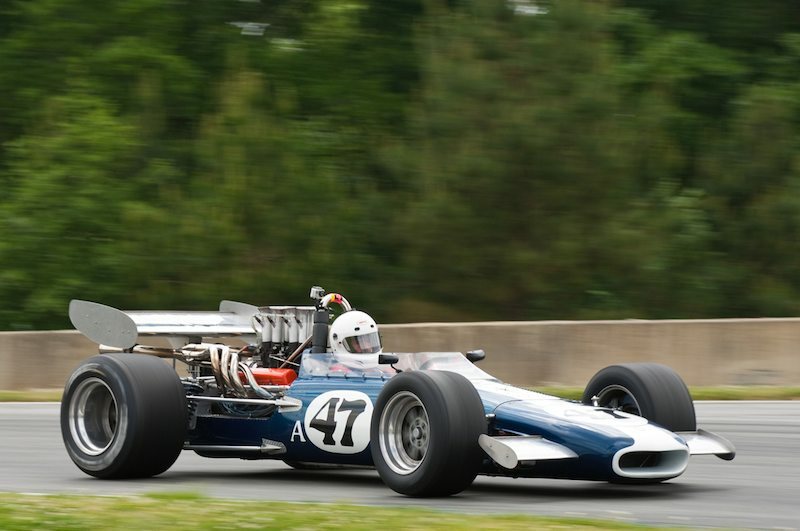 The race was dominated by Jim Stengel in his beautiful 1973 McRae GM1 F5000, winning by 12 seconds over Dudley Cunningham in his 1973 Lola T332, and the last spot on the podium went to Steve Davis, in his 1969 Eagle Mk5, beautifully turned out in blue and white. 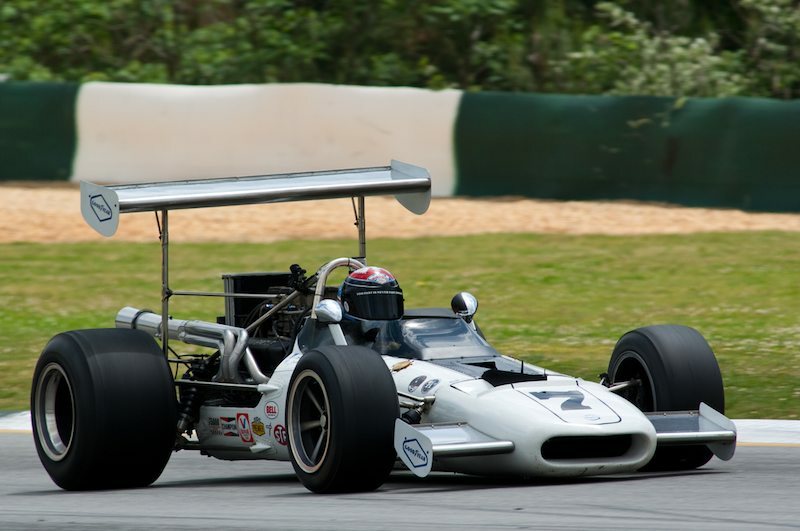 Tony Adamowicz finished 5th, in another 1969 Eagle, the same car in which he won the F5000 title in 1969, and it was Tony’s 69th birthday as well. The next feature was the International American Challenge, and by this time the sun was trying to peek through the clouds, but with limited success. At least no more rain fell and the track stayed dry. 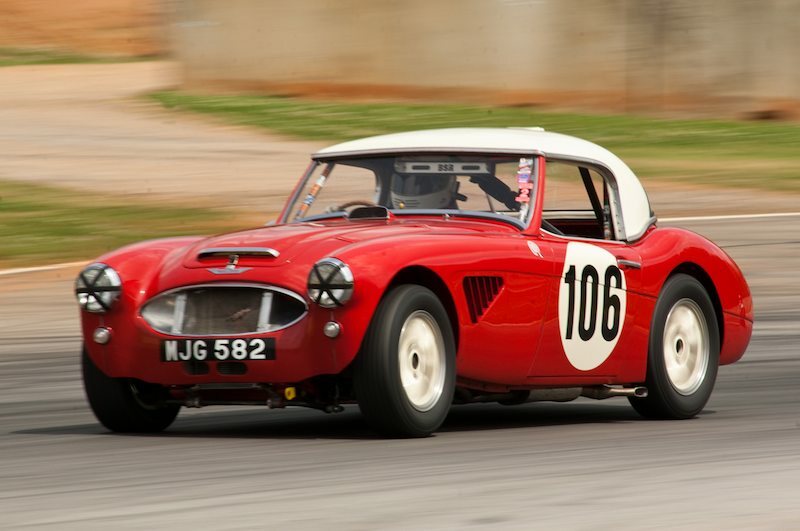 This race proved to be a good battle between Anthony Martin in his 1965 Cobra Roadster, and James Cullen in his GT-40, with the Cobra pulling out the win by less than 3 seconds. Local driver Tim Holland finished 3rd in his 1966 Ford Mustang. The last big race of the weekend was the Historic Enduro, featuring a wide variety of cars, from two 1970 Porsche 914s to the 2005 Champion Audi. The Audi and the Riley and Scott/Judd of George Robinson and Jack Baldwin again proved formidable, beating the Champion Audi and their great team of drivers, Bill Adam and Andy Wallace, by 18 seconds. 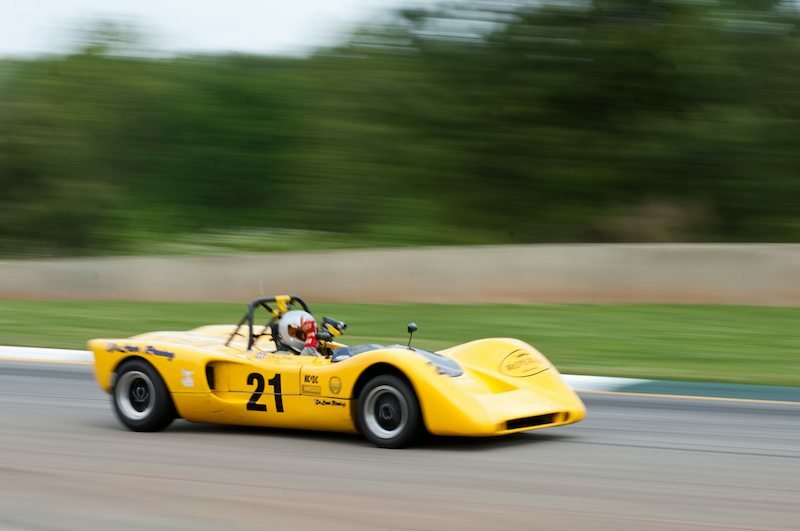 Third spot went to John Reisman in his Lola B2K40. 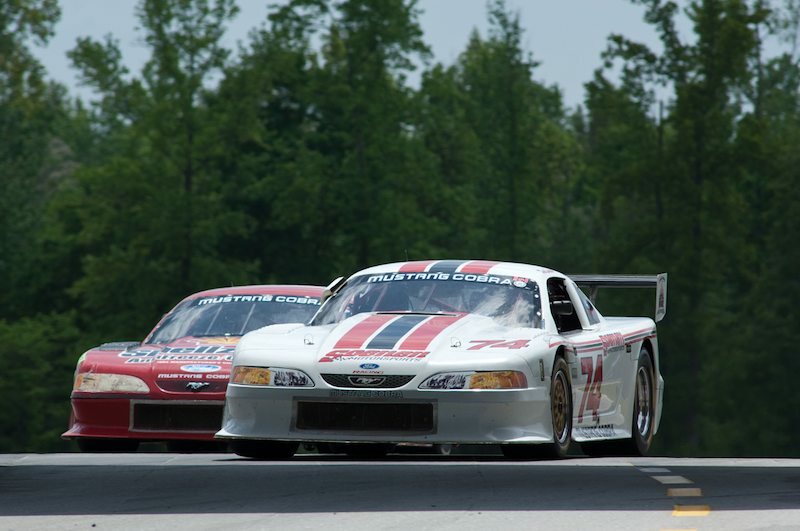 The most entertaining part of the first half of the race was watching two Trans-Am Mustangs, Don Soenen’s 1995 car, and Paul Reisman’s 1992 roar around lap after lap like they were tied together. They got separated after the mandatory 5-minute pit stop, with Soenen finishing 4th, and Reisman 8th. The crowds built steadily through the weekend despite the consistently threatening weather, and fan support for these great old cars was consistent and enthusiastic. 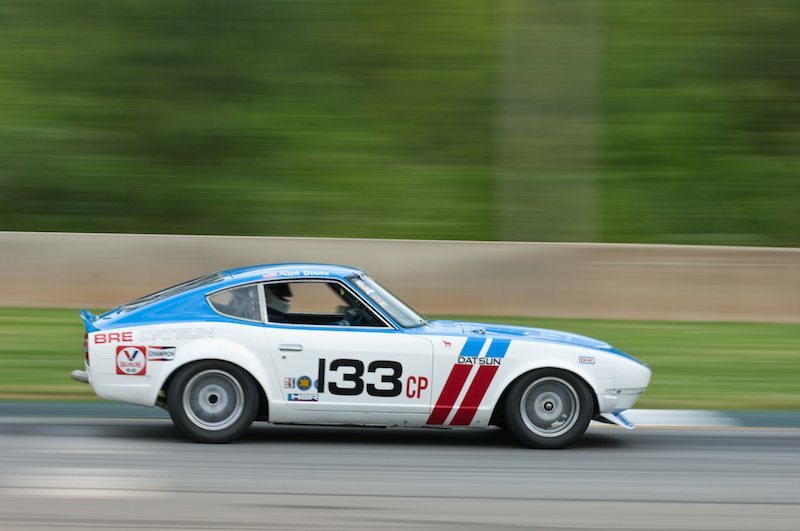 Run and sanctioned by Historic Sportscar Racing (HSR), the Mitty Speedfest was presented by Classic Motorsports Magazine and sponsored by Mazda. Thank You Sports Car Digest for the fine report and photos on the HSR Walter Mitty 2010. 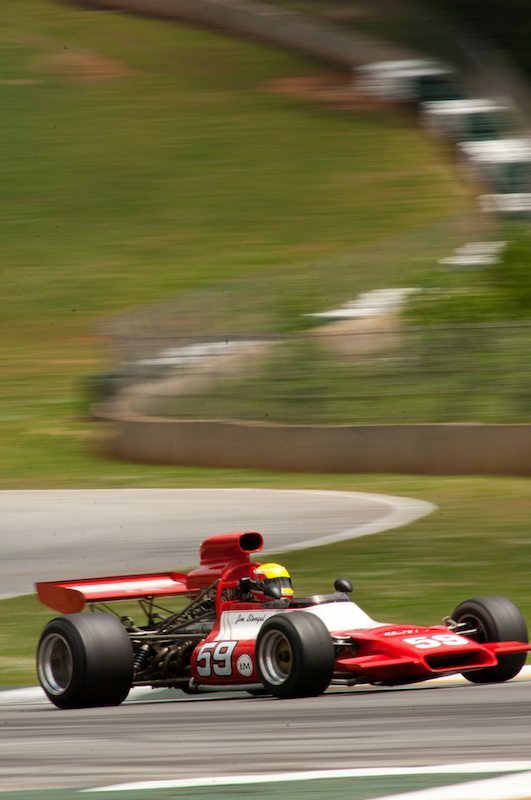 Road Atlanta was a great period setting for the return of the F5000 racing.It was great to compete and finish 2nd in class with the 1969 Championship winning RIAM entered Gurney Eagle….. on my birthday Cheers ! Very nice write-up and pictures. Wish I could have been there. Terrific article; anyone missing the race would have felt like he/she was there after viewing this article and the accompanying photos. Great job. Thank you for the great article on the Mitty. It is appreciated by all of us at HSR that work so hard to put it together and run it. We hope to see you next year at the 35th Annual Mitty! Thanks for the kind words and thank you all for putting such a great event together. We look forward to next year’s big anniversary. Sounds like a great event and all those cars look awesome. Would love to try any of them.